Kelley Blue Book tells us that Honda Accord, Civic, CRV and Odyssey all retain greater than 50% residual value at time of dealership trade in or private resale. What we discovered was Honda mania, with used car pricing bordering on hysteria. Turns out that either used car lots have tossed the Blue Book guidelines out, or demand for a used Civic is so high in our regional market that would- be buyers have abandoned sense and sensibility. What's your 8 year old Honda Civic worth? While K.B.B. tells us that a 6 year old Honda Civic retains the highest residual retail value in the industry, we were hard pressed to find one. On the West Coast of the U.S. a low mileage Civic is worth it’s weight in gold. While that me be a slight exaggeration we found only one 2008 Civic in Portland Oregon. While not ready for the crusher, a high mileage(107,200) Civic Coupe was priced at $12,900. This was an EX and retailed for $18,700 when bought new in 2007. Well past the expiration date for many cars, this 2 door presented in good condition was offered at 69% of original retail price. Has the used car world gone mad? 2006 Civic EX in black, 180,283 miles showing. Price: $8998. Not too long ago an eight year old compact car with 180,000 miles showing would be headed for the crusher, or, curbed at a hardship lot for far below wholesale. This high mileage Civic was being marketed for 45% of original retail price. We found Civic’s with 200,000 + miles priced at over $5800. They’re good cars but are they that good? Honda resale popularity is year and trim variant sensitive. When conducting this price comparison we found ourselves cruising the web, car price guides and local lots. The used car game has been played the same way for well over 100 years. We find it best to establish a relationship with your favorite local dealership, hand them a wish list and hold them to a specific model, mileage and price range. The strategy here is to intercept a trade-in before it goes on the lot. Do your negotiation at the front end of the deal, not after the cars been posted on the hot sheet.. The markup on new cars is dictated by the manufacturer’s msrp, Kelley Blue Book, Edmunds and other price guides.With an educated buying public forcing the profit margins down on new Hondas, car dealers make their profit on the resale of trade ins. Dealers buy low, sell high. In no case is this more evident than Honda. Honda’s reputation for a long lasting , trouble free ownership experience has pushed used Honda pricing to the highest in the automotive industry. The legend of Honda, a younger buying demographic and the climbing price of new cars has raised the price of used Honda Civics. Here’s a few price examples. 2008 Civic Coupe Ex 107,200 m: $12,900. 2008 Civic Hybrid 86,000 m: $10,500($1250) below book. 2007 Civic LX-M5 1.8 Liter i-4 cylinder: $14,500. 2007 Civic LX 25,578 m: $13,887. 2006 Civic LX 56,598 m: $12,948. 2006 Civic EX 180,283m: $8998. 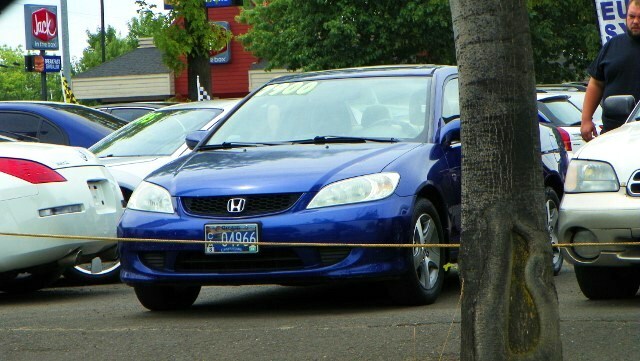 2005 Civic LX 129,260m: $9995. 2004 Civic LX 128,000m: $7988. When you walk onto a lot, know that the used Civic you're looking at most likely carries a 20% + price premium, this is your negotiation margin. Try to avoid extended service and repair warranties. If you do opt to purchase a warranty, read the fine print, know what the warranty does and does not cover. Honda is known for long term reliability. However, a car with 100,000 miles or more showing on the odometer has a wear part or two ready for repair or replacement. While the engine and transmission may be mechanically bullet proof, brakes, tires, tie rods, suspension, shocks and other “wear parts” may be in need of (immediate) repair or replacement. When you test drive the car, pay close attention to braking, handling, drivetrain and body noise. When in doubt, take the prospect to a 3rd party for inspection. It pays to perform some due diligence when buying a used car. Yes, we do hear from readers that have reported 200,000 trouble free miles from Civic. In closing, we find a low mileage, fair priced Honda Civic to be very elusive if not non existent. Good luck in your search. Let us know how you do, we’ll post it here. I have a 2005 Honda Civic LX -- 4-door sedan, automatic, silver -- in very good condition with only 22,000 miles on it. What's it worth? Good morning Richard. The market value of your car is determined by several factors, one being the location. Rust free? accident records, accessories, etc. My guess without looking at it $10,000 + a good place to begin is Kelly Blue Book, you may find it on line. I do want to sell my Honda civic 2015 with 11k miles. Any one interested please contact 8327052512 Arock. CIVIC 4DR LX ALABASTER SILVER WITH 12,500 MILES. $15,000.00. DEATH IN FAMILY, I HAVE 2 VEHICLES. MUST SELL. I HATE TO SELL THIS CAR, I LOVE IT. IT HAS EVERYTHING AND EVERYTHING WORKS. I CAN SEND YOU PHOTOS. I understand that the resale value of Civic sedan is excellent. How about the Civic Coupe? What one has better resale value, automatic or manual? I am considering a new 2017 Civic Coupe Touring and will keep the car for maybe 3 years. Welcome PT. Historically the Civic Coupe is in less demand. So, it may have a slightly lower retail value in your region. But there are many variables to consider: Performance modifications, general condition, mileage, etc. good luck. If you maintain your car you should come out o.k. at resale time. I purchased a used 2010 Honda Civic EX and no where does it have the word "Civic" written on it. Is this normal or am I missing my Civic word on my car? Welcome, Tim. That would be unusual. You may find replacement O.E.M. brand emblems on the internet. Note: it's not unusual for some car owners to remove brand plates. Are you being serious? Idk where you're from but in Michigan I'd say at least half the vehicles on the road are over 10 years old with 180k+ miles. Crusher.... lol. How about an engine swap instead. Jesus what are you from Beverly Hills or something?